Perogies & Gyoza: What are you reading Wednesday? What are you reading Wednesday? It's a rainy Wednesday here, which I'm happy about because it will wash away the ash still in the yard. I'm not feeling well though, so I wish I could stay inside with a fire in the non-existant fireplace and read all day. 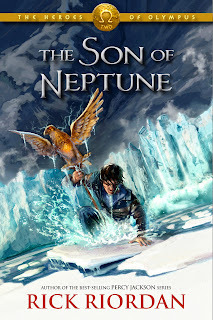 I'm reading the new Rick Riordan book, Son of Neptune (CAN, JP, US), the second in the Heroes of Olympus series. 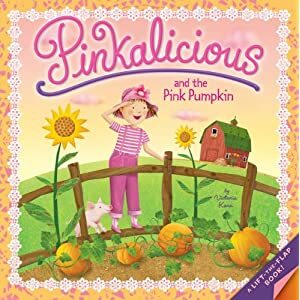 My kids are reading Pinkalicious and the Pink Pumpkin (CAN, JP, US). I am still trying to get through Ashes, Ashes by Jo Treggiari (CAN, JP, US). It's not that it's hard or anything, it's just that my listening time is very limited so it's 10 minute bursts here and there. What are you and/or your kids reading today? The Hunger Games! I'm almost done! My 11 month old is still stuck on Dr. Suess's The Foot Book and Goodnight Moon...I've got them memorized now! Totally envious of your ability to read actual books. I used to read books. Good books. Classic books. Now I read twitter. So, basically, I think civilization is ending. My DD is reading Old McDonald has a farm (with pop-up bits) and I`m reading The Road. If you enjoyed this post, please feel free to share it. I love comments! They make my day.